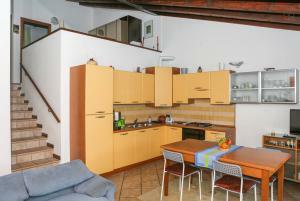 For rent: Holiday Apartment with pool and seaview in Castelletto di Brenzon, Lake Garda, Italy! Brenzone along the coast has large, long stretched beaches and fantastic scenery. The area offers fun, relaxation and rest. Castelletto is famous for the large number of restaurants offering different types of dishes for any kind of gourmets. The olive oil „olio d 'oliva Brenzone Garda DOP“ is inevitably in every dish and produced in the local oil mill. 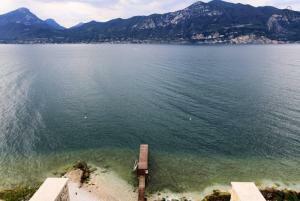 Spending the winter at Lake Garda .... a very special mood. The mildness of the climate and especially the quietness. During winter time the sunsets are gorgeous, then the Monte Baldo seems "burning". Walking in the western mountains f.ex. the Monte Cas is really advisable. Towns like Riva and Desenzano during winter time are much more attractive than in the summer. In case it should rain you can regenerate in the wellness centers Garda Thermae in Arco, Parco termale in Cisano or Aquaderns in Pescantina in a unique environment and relaxing atmosphere. Sport activities in surrounding area: windsurfing, kitesurfing, all kind of water sports, mountain biking, hiking on the Monte Baldo by cableway in Malcesine and Prada Costabella. Theme parks and fun just 40 minutes away by car: Gardaland, Moviland, Caneva water park and Parco Giardino Sigurtà. Cultural activities and leisure: wine and food itineraries, visit wineries, wine tasting, trips around the lake from the touristic seaports with the excursion boats, oil and wine museum. Only 5 km away from the flat a pilgrims' path leads by a 30 minutes walk to the mists of time forgotten village Campo. Just a ten-minute drive away in Malcesine you can visit the Della Scala Family Castle (10 km) and in Torri del Benaco the Scaliger Castle (9 km). Towns you can reach in only one hour by car or by public transport, Verona ( in summer the unavoidable open air concerts in the “Arena”) and Mantua (city of literature with Gonzaga castles and palaces). Will be advised at the time of booking. 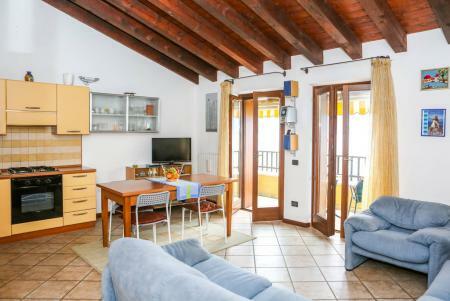 This holiday flat in very panoramic position is composed on the basement by a living room with a fully equipped kitchen and dining aerea, on the first floor there is an open space, two double bedrooms and a bathroom with shower. A special feature of this flat is that you can reach directly the beach and the private jetty by lift and underpass. Additional fee 30,00 for arrival between 6 and 8 p.m. In case of reservation a deposit of 20% of the total price is required. From June until mid September rentals take place from Saturday till Saturday. Arrival between 3 and 6 p.m., depature between 10 and 12 a.m. In case of long-term hire the costs, such as electricity and gas and are charged according to actual usage and price without surcharge!